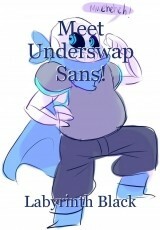 Meet Underswap Sans! A little bio and a tiny interview ^_^ This is not my AU. This is just my headcannon for this AU. L: Nothing, nothing. What do you like doing other than puzzles, Sansy? L: So, Blueberry, what would be your deepest fear? US S: ...I...I guess it w-would be...going through Genocide again. L: Hey, I'm going to go to let you cool off. See you later, Blueberry. © Copyright 2019 Labyrinth Black. All rights reserved. This page was created in 0.3330 seconds.